Ditch the workbooks and printables! 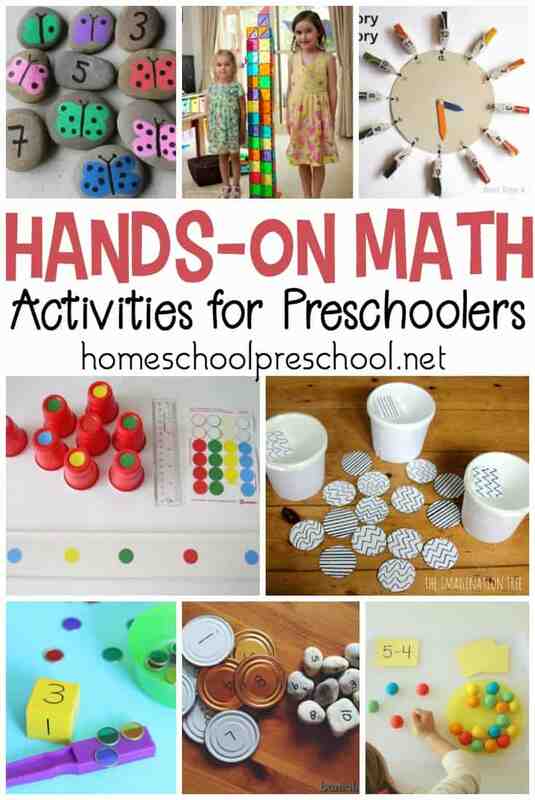 Teach counting, math facts, and more with these hands-on preschool math activities. My youngest is a workbook kind of kid. 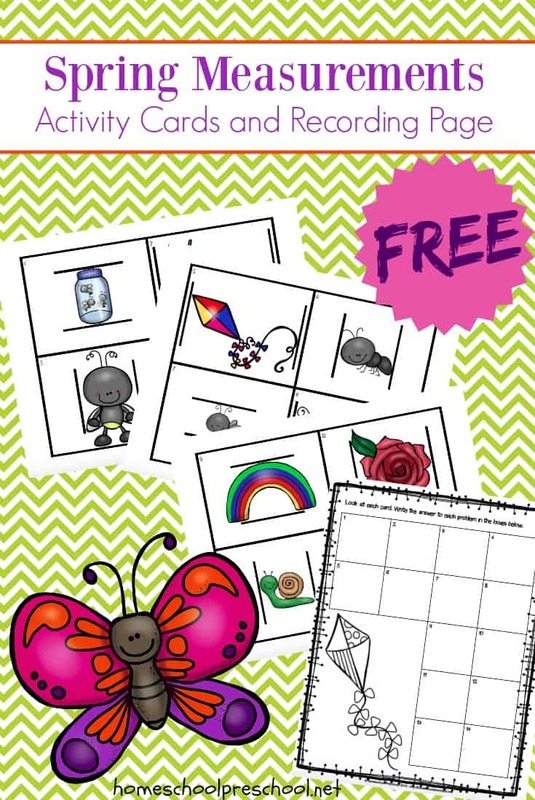 She loves workbooks and printables and other paper and pencil activities. My son, however, hates having to pick up a pencil. He would much rather use his hands to learn. 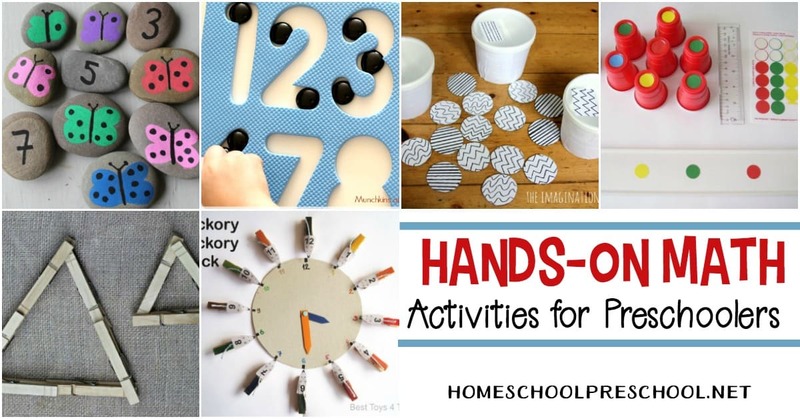 If you’ve got a hands-on learner, you’re going to love this amazing collection of hands-on math activities for preschoolers. Even if you have a paper-and-pencil kid like me, you can use these ideas to reinforce math concepts. Tots and preschoolers will work on early math and fine motor skills with this homemade pattern sort and drop game. Add this Hickory Dickory Dock matching clothespins activity to your nursery rhyme studies. Little ones will focus on fine motor skills, number and color matching, and learning to tell time (for older preschoolers). My kids have always loved popping bubble wrap. Here’s a fun way to review letters and numbers with bubble wrap. Introduce your preschoolers to geometry by having them create shapes with clothespins. Preschoolers will be amazed at how much water beads grow when they’re wet. Let them measure water beads when they’re dry and again when they’re wet and compare the two. Little ones will work on counting skills and number recognition in this hands-on Counting Falling Stars activity. Kids will explore what numbers look like (the number itself and what a grouping of that number looks like) in this activity based on the book 10 Black Dots. Little ones will work on hand-eye coordination, fine motor skills, number recognition, and skip counting as they lace these skip counting lacing plates. Your preschoolers will practice one-to-one correspondence as they complete this Roll & Count Math Game. This isn’t make-believe. Preschoolers can really turn into Cinderella as they try on shoes and sort them by size. Your child can have fun practicing math facts with a simple beach ball. 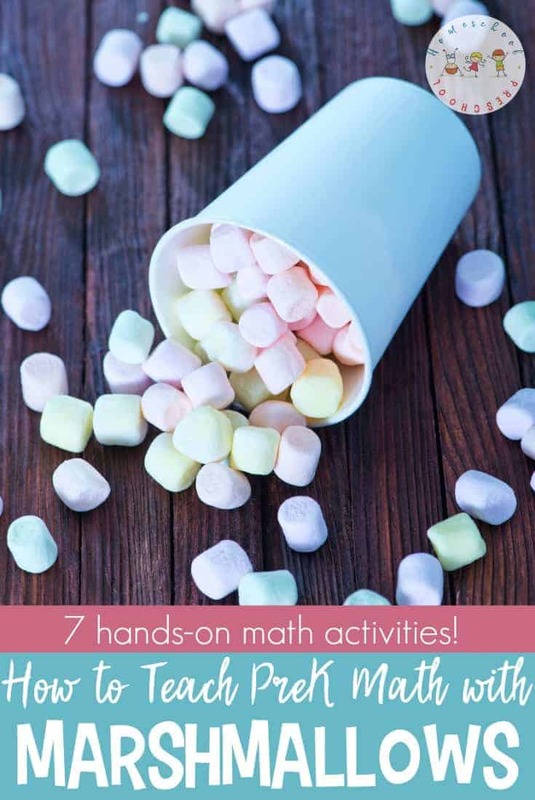 There are many ways to adapt this activity to fit your current math theme. Practice patterning with red cups and colored dots. Whether your students understand “golden ratio” or not, they can still go on a garden scavenger hunt to find shapes in the garden. These DIY butterfly number stones are a great hands-on way to get preschoolers to practice number recognition and counting. Explore these nature math activities that will make your kids love learning how to measure things. Recycle cardboard boxes for this DIY Counting with Cardboard Game for preschoolers. Construction Race is a hands-on active learning game that uses action and gross motor coordination to learn and review numbers. Preschoolers will love this Bubble Wrap Number Hop which adds a fun sensory element to an ordinary math lesson. Introduce young learners to fractions with a hands-on math fraction art project. Even if your preschoolers aren’t ready to learn their math facts, you can introduce them to the concept of subtraction by playing Playdough Subtraction Smash with them. You could even tweak this to practice number recognition and counting if that is where your kiddos are. Where ever you are in math with your kiddos, you can reinforce those skills by building an outdoor math game board focusing on the skills you’re working on right now or to review previous skills. Water squirter math games are easily adapted to work on various math skills and will keep kids cool (and learning) on a hot summer day. Older preschoolers and kindergarteners can learn about place value with building blocks with this hands-on approach. Learning to count on sets the stage for learning to add and subtract. Here’s a fun way to practice counting on in nature. Little ones can burn off some energy while they work on number recognition with a backyard number matching race. Grab your sidewalk chalk and prep this number recognition activity that is both fun and educational. If your preschoolers like to collect toys (Shopkins, Hot Wheels, Littlest Pet Shops, etc. ), incorporate them into your learning fun with this fun number recognition, counting, and sorting activity. 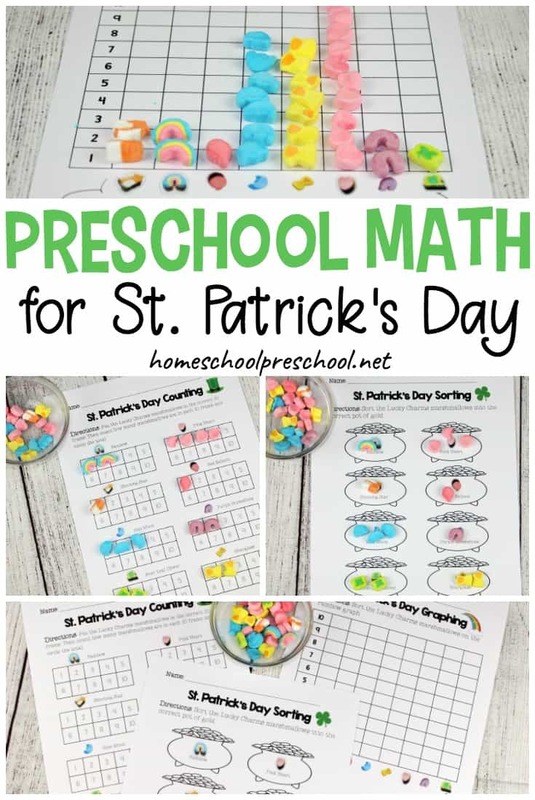 Gather up some colored gems or buttons (or grab some on your next trip to the dollar store), and let your preschoolers practice making patterns. With so many fun hands-on activities for teaching and reinforcing preschool math skills, how will you choose which one to do first? Manipulatives are the way I learned math easier when I was a kid.